If you have purchased the Magic of Circlework or Magic of Circlework Training Manual, click here to access your bonus material. Circlework is a nurturing and spacious practice that honors the feminine spirit. Developed by Jalaja Bonheim, PhD, it addresses women’s hunger for authenticity and intimacy while also connecting them with their feminine essence. Through a wide range of tools that include not only talking but also movement, touch, and immersion in nature, a space is created that feels equally safe and sacred. Here, women have space to listen deeply, both to their own hearts and souls and to one another. Circlework has also proven its value as an effective peace practice that is being used in the Middle East to unite Jewish and Palestinian women. 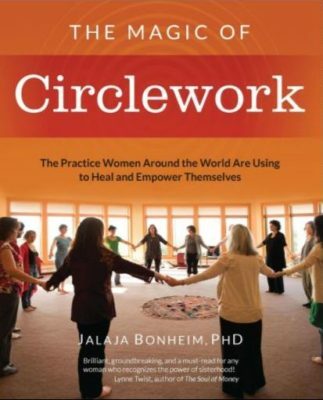 Though Jalaja is an award-winning author, none of her previous books reveal the concepts and tools that make Circlework such a magical experience. Until now, the only way to access the secrets of Circlework was to attend her retreats or trainings. Now, for the first time, she explains how ordinary circle gatherings are transformed into true mandalas—fields of sacred presence imbued with love, peace and joy. The Magic of Circlework includes the stories and voices of many women who are using Circlework to heal their lives and relationships. Inspiring embodiments of feminine power, they have bonded to form a global sisterhood that transcends all national and religious boundaries. Anyone interested in the process of healing and evolution will love their stories of life-altering encounters and awakenings. At the same time, Jalaja emphasizes that readers can use the principles of Circlework even if they never attend a circle gathering. Circlework is, after all, not just a group process. It’s also a spiritual practice that approaches the circle as an inner healing medicine that all humans are born with. Throughout the ages, many have recognized its potency. The great psychologist CG Jung, for example, described the circle as “the archetype of wholeness and divinity”. The Magic of Circlework teaches us to tap this powerful inner source that can help us stay centered, balanced and whole, even in the face of outer turbulence. How to create sacred space and live in it, all the time. What third stage circles are, and why we need them. How to use the power of sacred geometry to bring healing and connection. How circle gatherings can foster inner and outer peace. Why we usually misunderstand the nature of the sacred feminine and why we need her. What leadership grounded in feminine values looks like. How to heal old wounds caused by group rejection. Circlework as a tool for mental health practitioners. How we can create ripples of healing and transformation. Purchase of the book includes access to valuable online resources, including a list of recommended music for circles, audio meditations with Jalaja, and much more. To receive a notification when this book is published, please enter your email address above. Delightful, entertaining, and wise, The Magic of Circlework is a seminal guide for all of us who want to change the world for the better, and realize we can’t do it alone. This amazing book shows us how we can co-create sacred space and build community in ways that are profoundly healing and sacred. Circlework dissolves our separateness and awakens us to the shared heartspace that is our evolutionary potential. This book is a deeply wise, compassionate and invaluable guide for our times. The Magic of Circlework is a wonderful, right and useful book, essential for building and sustaining synergistic spiritual community. Read it and use it! The Magic of Circlework celebrates the transformative, empowering, spiritual and magical power of women’s circles. Drawing from decades of experience leading circles in many parts of the world, Jalaja Bonheim includes many inspiring stories and examples. 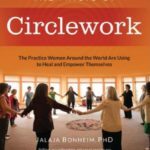 An invaluable resource for any women who belongs to a circle or wants to facilitate circles!